Safe Hands and Thinking Minds Associates draw on a range of interdisciplinary expertise, theoretical perspectives, and evidence bases to promote, solidify, and develop high standards in areas of parenting, trauma, adversity (ACE’s), attachment, fostering, adoption, asylum-seeking & refugee young people, and culturally/adversity/trauma-informed and trauma-responsive organisations. Dr Treisman and associates are dedicated to delivering specialist and tailor-made psychological and therapeutic training, workshops, and consultancy to a range of diverse professionals, carers, and parents. These services are committed to providing attendees with increased knowledge, skills, and best practice models which aim to meet and exceed national minimum standards. All services are relationship-led and focused; and come from an attachment and trauma foundation. The training and consultancy services offered are wide reaching and therefore specific needs should be discussed further so that a tailor made approach can be offered. Please see the Training and Consultancy sections for further information, and examples of the type of services offered. 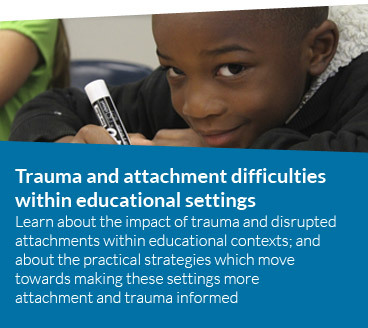 Understanding, reflecting on, and intervening with attachment and trauma related areas. Supporting organisations and systems to become more meaningfully culturally/adversity/trauma-informed and trauma-responsive. Promoting homes, parenting, and environments which are therapeutically re-parenting children and adolescents; and are attachment and trauma-informed and responsive. This includes educational, residential, organisational, and home contexts. Improving and optimising placement experiences/stability for the whole family. Carrying out robust, thorough, and holistic assessments. Planning for individual children and families including around areas such as therapeutic life story work, contact arrangements, and/or transition plans. Thinking about complex cases from multiple perspectives which include cognitive, behavioural, systemic, biological, and psychodynamic concepts. Reflecting on and intervening with specific presenting behaviours. Working effectively with specialist sub groups such as within schools, with unaccompanied asylum-seeking young people, and with young mothers. Celebrating, recognising, and building on young people’s resiliencies, positive qualities, and protective factors. Children are doers more than they are talkers, and when we join them in doing, we find we are able to discover the story at the child’s pace. Dr Treisman has given us a wonderful book to help us to do this. Full of ideas, exercises and compassionate ways of joining with children to fully discover who they are, and to help them to manage difficulties that they are experiencing. This is grounded in the best of what we know about relational trauma. This book will enhance the most creative of us, and be a rich resource for those of us who doubt our own creativity. It will give all of us ways to go slower, to help children to feel safe enough to reveal their own story, and to find the confidence to allow us to share this story with their safe parents. Now healing can begin. My treasure box is certainly richer for having this book on my shelf. “Relational trauma requires relational repair’ says Dr Treisman throughout her book and it’s a mantra worth repeating. Her book explains what relational repair really involves, from creating safety and regulation, to exploring complex and layered emotions to tackling rage and sleep disturbances. 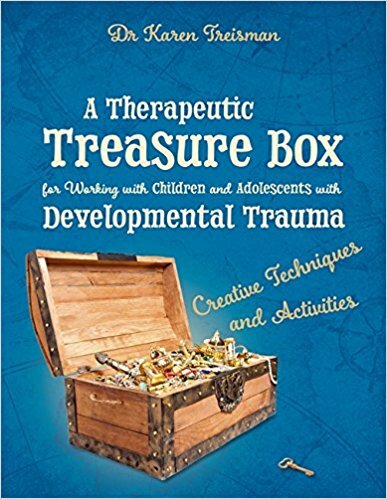 It is packed with ideas and materials to guide and support therapeutic conversations, much of which could be used by therapeutic parents. What I especially love is the combination of compassion both for child and parent and its insistence on a sound, scientific approach. 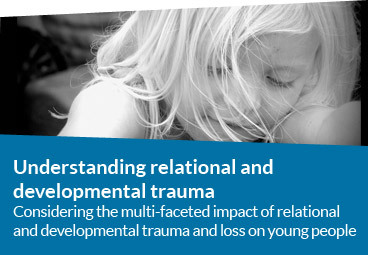 The pictures, the pebbles, the glue and the glitter are all set within a robust trauma-informed framework that reflect the emotional complexity of building a meaningful relationship with a traumatised child. For those who labour at the coalface of relational repair, it is a nourishing read that will top up your therapeutic tank and make you feel just that little bit more encouraged and cherished and perhaps even vindicated. It deserves to be widely read by all those involved in supporting the healing of relationally traumatised children from commissioners, policy makers and academics right up to foster carers and adoptive parents”. 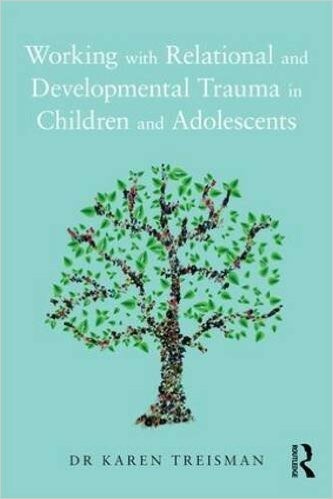 “Dr Karen Treisman has written a most comprehensive book for preparing clinicians to work with the complexities of treating children and adolescents who have experienced developmental trauma. The challenges of providing such treatment is great on many levels and Dr Treisman addresses them all, from understanding and assessment to providing the most appropriate therapies for these young people and their caregivers. Not stopping there, Dr Treisman also informs us of the need to provide sensitive interventions within systems such as social services, education, and residential care that may themselves become traumatized through the challenges of caring for these very troubled children and youth. An important contribution to the field for both experienced clinicians and those just entering it.” – Daniel Hughes, Clinical Psychologist, developer of Dyadic Developmental Psychotherapy, author of Building the Bonds of Attachment, 2nd edition, (2006), and Attachment-Focused Family Therapy Workbook (2011). 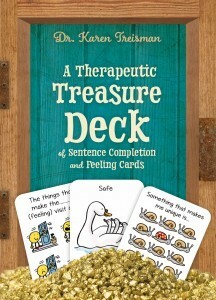 A pack of 70 cards and explanatory guide offers a playful, non-threatening way to explore feelings, and to form effective coping, regulating, soothing, and grounding strategies through a range of games and activities. 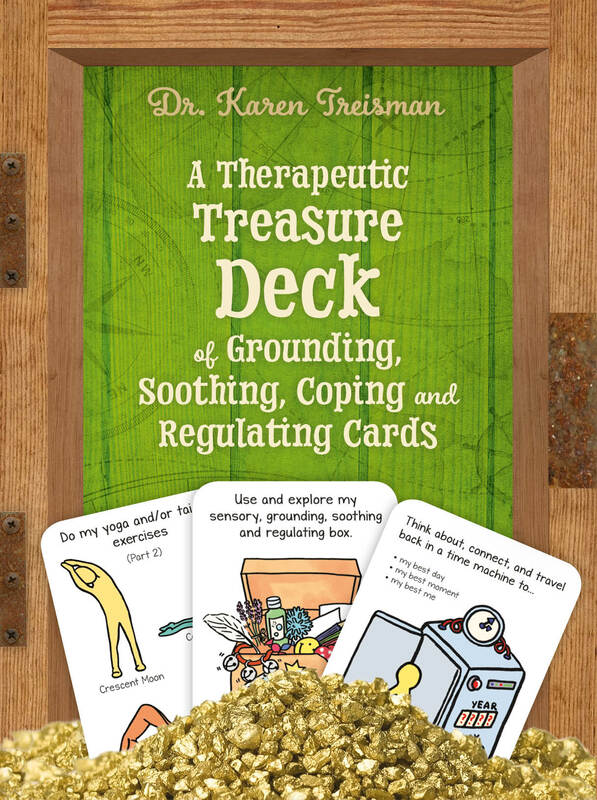 Designed to work with both the brain and body, the cards address a wide range of common issues including anxiety, stress, low mood, sleep difficulties and emotional dysregulation. To do so, they employ a range of proven strategies including cognitive techniques, nurturing activities, sensory strategies, body-based activity and creative exercises.